In “Funding Gaps 2015,” we use the latest available data to analyze funding disparities across the nation and within states. 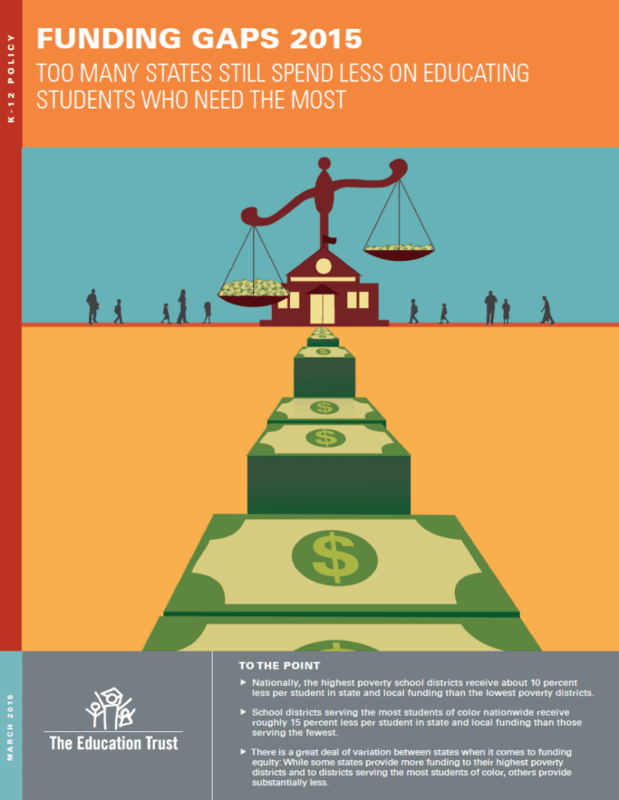 Our analysis finds that nationally, the highest poverty districts receive about $1,200 less per student than the lowest poverty districts. The differences are even larger — roughly $2,000 per student — among districts serving the most and the fewest students of color. When we look at funding gaps within each state, we find a great deal of variation. While some states provide substantially more funding to their highest poverty districts, others provide substantially less. The trends looks even worse when we consider that students in poverty are likely to need additional supports in school. Moreover, some states that allocate more funding to their highest poverty districts are still providing substantially fewer dollars to districts that serve the most students of color than to those that serve the fewest. “Funding Gaps 2015” provides an overview of funding equity by race and poverty concentration across states, while our State of Funding Equity data tool offers more detailed information for each state. For a detailed description of our methodology, please see the technical appendix. The State of Funding Equity data tool shows how the revenues of the highest poverty districts in your state compare with those of the lowest poverty districts, as well as how the revenues of districts serving the most students of color compare with those of districts serving the fewest. Learn how state and local funds are allocated in you state, and how your state compares with others.